Brussels, Belgium - SMEs are key drivers for local job-creation and positive social change. Moody’s launched a new initiative aimed at small-business owners – especially women entrepreneurs. The goal is to provide insight into what the financial sector expects from them and how they are assessed in terms of getting credit. 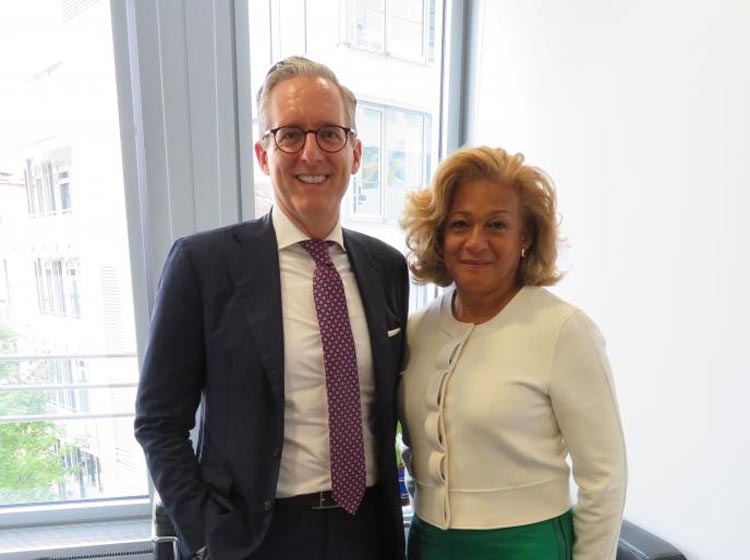 Arlene Isaacs-Lowe, Global Head of CSR at Moody’s Corporation, and Jens Schmidt-Bürgel, Managing Director at Moody’s Deutchland, explain how Moody’s works to empower people with financial knowledge through their ‘Reshape Tomorrow’ initiative. Moody’s has recently joined CSR Europe as a corporate member. Moody’s CSR strategy now goes beyond philanthropy. How did this happen? “In the last five years, Moody’s – and the financial sector generally – has significantly expanded its global footprint. We took a step back last year to understand how Moody’s approach to CSR should be positioned to match this perspective,” says Arlene Isaacs-Lowe about the corporation’s current CSR strategy. “We went through a consultative process with input from employees and external stakeholders to create a strategy that reflects the issues our employees care about most and the challenges we believe we are in a unique position to solve. The results clearly stated that our primary focus should be economic empowerment of SMEs and local businesses, especially female entrepreneurs." What is the strategy behind the ‘Reshape Tomorrow’ initiative? “‘Reshape Tomorrow’ is a program targeting small-business owners – especially women and those who possess untapped potential." "SMEs generate job growth, and a key barrier to small businesses growth is access to credit. ‘Reshape Tomorrow’ draws on our considerable visibility and expertise in this area. Through this initiative, Moody’s can promote greater financial inclusion by providing more small-business owners with the knowledge and resources needed to obtain credit and build stronger businesses. Our goal is that business owners get better insight into what the financial sector expects from them and how they are being assessed in terms of getting credit." How does Moody’s integrate CSR in its day-to-day operations? “In addition to ‘Reshape Tomorrow’, environmental considerations are a key part of our CSR outreach. This reflects mainstream investors’ growing interest in environmental, social and governance (ESG) analysis,” says Jens Schmidt-Bürgel. “Moody’s credit ratings incorporate a forward-looking view of all issues that can materially impact the credit quality of a given sector or debt issuer. Analysis of ESG considerations is an important part of this. For example, when considering environmental issues we look at the effects of hazards, such as droughts, pollution and natural disasters, as well as the consequences of regulation designed to prevent or reduce those hazards."